← We’re All Doing the Best We Can… A Motto for ITC? Today, as never before possible, a network of researchers from all around the world could usher in a new golden age of ITC, or instrumental transcommunication, the use of technology to get in touch with the other side. In other words, a United Nations of afterlife research is possible today, for the first time in history. That’s what we tried to accomplish with INIT in the late 1990s, and although we experienced unprecedented miracles that gave us a taste of the world-changing possibilities, in the end we faced too many insurmountable obstacles, especially the language barrier, the cost of international conferences and meetings, and our inability to set aside egos in order to sustain unity and harmony in the ranks. The original INIT members simply faced too many obstacles to carry ITC into the golden age… but today things have changed. Will I try to launch that new ITC network in my own golden years (I’m 66 now)? Very unlikely. It would be a substantial effort, and I’m not sure I have the energy and enthusiasm for it. If I knew for certain that this new network would get the level of ethereal support that enabled the miracles of INIT… and that would depend on members’ willingness and ability to set aside their egos. No simple feat! In either of those cases, I’d drop everything to once again make ITC my main reason for living. Whoa. Just the thought of plunging head-long into ITC research brings back stark memories of what I went through the first time around. In 1992 I started dedicating most of my effort to ITC, first with George Meek, then with the Harsch-Fischbach couple and INIT, which we founded in 1995. ITC became my passion. I soon had to quit my technical writing work in order to do everything for INIT (writing, trying to mediate the conflicts, corresponding with members, planning and organizing the annual meetings in different countries, setting up a nonprofit foundation, finding donations to pay for those expensive meetings….). I received no financial compensation for my work. I tried to sell books and newsletters but didn’t even come close to breaking even. Still, I loved doing it, knowing that the miracles we were experiencing were well worth the sacrifice. It wasn’t an easy time for our family of three. We were able to live on my wife Regina’s school counselor salary, and thanks to her sacrifices we carried on. In 2007, several years after INIT had quit functioning, I resumed my tech writing work, and Regina retired soon after… a suitable reward for her years of sacrifice. Well, this year I quit tech writing (again) and I also retired. So, am I ready to resume full-time ITC? Probably not, even though maintaining an ITC research network would be different now. Much less expensive… and maybe not quite so much work. Mail, books, and newsletters would be replaced by websites and emails. Annual meetings would be replaced by videoconferencing. Things would be simpler… and cheaper… but still… a substantial effort! Anyway, the least I can do before I fade away this lifetime is to figure out as best I can what exactly will be involved in the project, and lay out the ground work for a new generation of ITC researchers. That’s my aim with this “Golden Age of ITC” series of articles… to set the stage as best I can for Act Two: The Real Golden Age. The website and all the subsites would probably be built and managed with WordPress. There are two forms of WordPress—the simple version (wordpress.com) and the powerful version (wordpress.org). This macyafterlife site was put together simply using wordpress.com with its many templates and beginners’ tools. 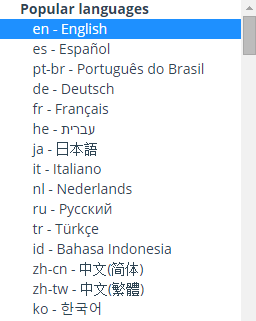 There’s also a larger WordPress menu that includes ALL the major languages. Each subsite could be built around one of those languages. The new website and its growing list of subsites would have to run on a good WordPress host, such as Bluehost, using a VPS (virtual private server)… as opposed to shared hosting or a dedicated server. And that is most of the basic technical information necessary to launch a website for a miraculous, new, international, multicultural ITC network… at least at this point in time (autumn, 2015). As technology evolves, new technical options will probably become available in the future…. There are various videoconferencing options today, ranging from free skype chats on your laptop computer with a few friends… to pricey and powerful Polycom systems where an entire wall can be covered with large video screens showing many participants amid powerpoint slides in a meeting with flawless audio. As the ITC network evolves and grows, various subgroups speaking the same native language or bridge language can determine the videoconferencing systems that best suit their purposes… and pocketbooks. Reports of those videoconferences could be posted on the website so that any member could view the meeting content through automatic translation. ITC is often defined, simply, as the use of technology to get in touch with the other side. In truth, there’s more to it than that. Successful ITC contacts (spirits delivering information into our world with the help of our equipment) require a resonance of attitude among researchers… a sustained harmony… which is no easy feat when we humans have to contend with the fears, doubts, desires, jealousies, and resentments that so easily interrupt our day-to-day lives and disrupt our relationships here on Earth. The members of a successful ITC network will have to strive to overcome those hormonal dramas… and only when they succeed will they be able to attract the sort of help (ethereal help) necessary to open an ITC bridge. There are ethereal gatekeepers who can open and sustain an ITC bridge once researchers on Earth can achieve a resonant condition with unity of mind… and once that ITC bridge is opened, information can stream into our world through TVs, computers, telephones, radios, and other technologies in the most miraculous ways. But achieving that resonance requires inner work for everyone involved in the new network. Even if you regard yourself as the kindest, calmest, most tolerant person you know… don’t kid yourself. You will be tested. “Personal coherence, also known as psychophysiological coherence, refers to the synchronization of our physical, mental and emotional systems. It can be measured by our heart-rhythm patterns: The more balanced and smooth they are, the more in sync, or coherent we are. Stress levels recede, energy levels increase and our brain and what HeartMath calls the “heart brain” work together. It is a state of optimal clarity, perception and performance. HeartMath tools and technology have been scientifically proven to help us achieve personal coherence. I hope to add more personal refinement tools to the list in the coming months as I learn about them. I’ve been familiar with these two institutes since the days of INIT. In fact, I recommended a joint project involving INIT, HeartMath, and Monroe to our group. All but two of the INIT members ignored the idea. The two who responded suggested joint projects with other institutes instead (Nathal Institute in Germany and Noetic Sciences Institute in San Francisco)… giving you an idea of how difficult it is even to get bright minds and good hearts to resonate together on a good idea. This entry was posted in Uncategorized and tagged high-tech breakthroughs for global collaboration, multilingual websites, personal refinement for spiritual pursuits, videoconference. Bookmark the permalink. A most valuable posting Mark…I hope your efforts in bringing forth your deep experience and insight with afterlife communication will blossom from the precious seeds you are planting. These postings really help me reflect on my own inner shadow and our cultural shadows, and it is here that the hang-ups of successful transcommunication are born. John, I always feel as though you’re my spiritual big brother. The one who saved my life when I was a little kid. You’ve done so much good for the world! (as well as for me)… it’s hard to imagine there’s more to come. But I sense huge things in store, and I’m looking forward. I will support you in any way I can Mark. Somehow I feel you’re important in all this. Yes, that’s been the crux of my meditations for several years. Thanks, Tosca. Right on, as usual. The next morning they begin to wonder if there’s something more. At that point maybe they’re ready to transcend the savage side of life and commit to resonance and unity of mind with other souls who’ve survived the battle scars of life on Earth. Those brave, persevering souls will usher in the Golden Age… and salvage this rag-tag culture we call humanity… by connecting to empathetic ethereals who see the big picture and decide, yes, there might still be hope for that Earth world. As I recall, the British producer of that video (Tim Coleman) was working with the American film producer Dan Drasin on a documentary, and somewhere along the way they split off to produce two separate afterlife documentaries. Here’s a link to Dan’s film. I wasn’t aware of Tim’s version until you pointed it out on youtube. It was most amazing how the miracles of INIT and the miracles of the Scole group began and ended around the same time… suggesting to me that the ‘gatekeepers’ of ITC (The Seven) were controlling the bridge in both cases. Also. the Italian researcher Marcello Bacci was involved with our INIT group and came to one of our international meetings. The Timestream spirit group was/is very aware of his great work! This is a worthy initiative, aligned with the spiritual plan, as i understand it. Contact with the post-mortem world via the radio has been prophesied in theosophical teachings. The ashram of a Master of Wisdom (Master H.) is probably facilitating the groundwork for this work from the inner side. I think that the plan has been delayed due to Humanity’s temporary failure to apply the lessons learned during the Great War (1914-1949). Premature opening of this channel of communication with the other side would be dangerous. In the hands of the selfish group of people who currently control world affairs, such technology would be misused. Still, there’s a need to scientifically prove the survival of consciousness after death. Proving this will be a major blow to the current materialist brain-mind belief. Such impersonal focus would mitigate the risk of personality frictions in a group devoted to this purpose. No personal contacts with the other side except those based on altruistic friendship should be sought; no pulling back those who have earned their right to move on the spiritual path; avoid earth-bound spirits seeking to obsess weak-willed brains.The aim should be to contact the higher levels of the post-mortem human world and the angelic kingdom. Self-forgetfulness, harmlessness and right speech foster right relations in a research group and would open the door to the other side too. I don’t worry too much about people misusing ITC for selfish purposes. Once the savage side of our nature takes over, ITC bridges shut down… since they need resonance to sustain. Noble attitudes (love, trust, good will…) foster order and peace and sustain resonance, while savage attitudes (fear, resentment, envy…) always lead to conflict and chaos, so that things fall apart in human affairs. I like very much your focus on “self-forgetfulness, harmlessness and right speech” as a way to bring out the noble side. I’ve been in touch with this work since 1988. I reconnected with your more recent work from a comment by my friend James in my blog (THOTH) two years ago. Thanks for that link, JB. I hope to explore more deeply from there. Shortly after I began to work with George Meek (the Spiricom fellow), he began to “feed” me books and booklets and articles about the hierarchy and the various masters… books by Virginia Essene… books channeled from the “Ashtar Command”… the Life and Teaching of the Masters of the Far East book set…. It all stretched my mind very quickly. Before that, in the mid-1970s… (correction, mid 80s, around the time I got married), before I really took a spiritual path, I was inspired to visit Jan van der Linden in New York City, who was running the School for Esoteric Studies, which was associated with Triangles and The New Group of World Servers… which I believe you are also associated with. Jan contributed to a book I was writing at the time. I guess there was always something inside pulling me in this direction, even when I was a confirmed agnostic. Long story short, I’m glad our paths have crossed. May the Love of the one Soul characterize the lives of all who seek to aid the Great Ones. I’ll spend some thought correlating my concept of ‘the noble side’ with your “self-forgetfulness, harmlessness and right speech”. One thing that seems to be a real challenge in terms of the ‘inner work’ aspect of all of this is the de-calcification of one’s pineal gland, or Third Eye. One website describes it as our “spiritual antenna”. My main challenge would be to remove my reliance upon caffeine. Even though the common methods that are listed for the de-calcification process are for the specific purpose of enhancing our alignment with the worlds of spirit, I feel as if they would help people to achieve an overall richer and more fulfilling form of purity during their existence on earth. I strongly believe that efforts need to be made for people to heal themselves from within – both physically and spiritually. I remember reading how you were told “You need to heal yourself before you heal the world”…so very true on so many levels! Yes, those words of Dr Day during my bout with colon cancer (heal yourself before healing the world) changed my focus on things. While living on this planet, though, it seems that healing is a life-long task for just about everyone. I’m a writer and editor. Happy to help in any way I can. Hi ED… what kind of writing do you do? I’m in Mumbai. Have written a couple of books related to local politics and culture, history. Have been editing magazines and books since 1990. Doing nicely. Work from home on my own; my time is mine. Happy to be of service in this field in whatever way I can. Have been studying the paranormal for a while now. Departed loved ones connect from time to time, sometimes in voice directly in my ears, at times in a semi-dream state. Have seen them physically in various stages. Deeply interested in the afterlife. Have had several OBEs over the years and one NDE in 2004. Got another 2 years and three months of life left. Happy to make myself useful. Thanks for the information, Gayatri. I am considering developing a basic international website as described in this article. If so, there could be some interesting possibilities for a good wordsmith like you, in India. I have been given the information that end of 2017 is possibly my exit point. I’m perfectly healthy, and not too old, but I’m needed there. Of course, I’m delighted! At times I’m shown my own self doing some sort of work related to inter-dimensional communication from there. Have always been interested in that. There’s much work to be done in that field, whether from here or there, but then you know all about it! Thanks for that background, Gayatri. I’ve read about various Hindu mystics who knew in advance of the date of their passage from Earth to spirit… and it fascinates me. Our spirit friends have told us that from their view earthly time is just an illusion, and they have great difficulty making accurate predictions of future events on specific dates. If you’re able to make a natural, peaceful exit the end of next year as planned… congratulations to you!… and enjoy paradise! 🙂 thank you. One can only hope for the best! I’ll be kept here till the time I am needed but I personally await the beloved spirit world. Any way, whether it is for another 2 plus years or 20 plus, I’m available for this work if you ever need me! It would be an honour to be of some service in this field. Exactly how I feel. I love family and friends and my work here on Earth with ITC and afterlife research… but I’m ready for paradise ANYtime. Till then there’s plenty to keep me busy… lots of good feelings to share with loved ones….No rush (and nothing personal to the planet and its people), but getting off this at-times-wretched world will be a blessing. I probably won’t be assembling a new ITC group on this side in my remaining years, but I’ll probably finish up some preliminary work… develop a multilingual website, start collecting contact information for people who seem to resonate with the project, that sort of thing. I’m still trying to figure out what “right speech” is supposed to mean. Of course, a Buddhist’s view of “right action” is different from the Pentagon’s view of “right action”… noble on one hand, savage on the other… so I’m thinking this idea of “right speech” is PROBABLY along the lines of what the Buddhists have in mind.